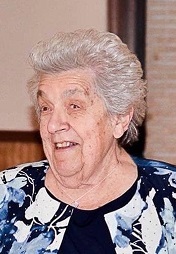 Obituary for Faye G. Quirk | Seamon-Wilsey Funeral Home, Inc.
SAUGERTIES…..Faye G. Quirk, 84, of John St. died suddenly Monday, April 15, 2019 at the Westchester Medical Center, Vallhalla, NY. Born March 21, 1935 in Peekskill she was the daughter of the late Norman and Helen Rundle. A area resident for many years she and her husband, Bob, could be seen in the mornings as frequent visitors for breakfast at the McDonalds on Rte. 9W in Saugerties and nightly during the summers manning the kitchen of the Saugerties Babe Ruth League. She saw many Saugerties ball players come through the league during her time from 1994-2008. She was a member of the Saugerties American Legion Auxillary. Survivors include her husband, Robert M. Quirk, with whom she recently celebrated their 62nd Wedding Anniversary. 2 Sons: Edward R. (Lee) and Joseph R. (Alice) Quirk. A Daughter, Eileen Weaver, a Sister, Gerri Bopp, 7 Grandchildren: Stephanie Quick, Joshua and Sean Weaver, Robert, Christopher, Lorna and Mckena Quirk, 6 Great Grandchildren and several nieces and nephews also survive.